Believe me, I get that there’s no enjoying every moment when the toddler and tween are throwing temper tantrums at the same time and the five- and seven-year-old are fighting over whose foot is crossing the invisible line in the back seat and the nine-year-old is willing to argue that the sky is red just as long as she can disagree with you. But the other day I was walking down the street behind my baby girl, watching her blonde hair swing as she marched toward a friend’s house, and I couldn’t help but feel like I was really seeing her for the first time in weeks. When did her hair get so blonde and so long? When did she get the courage to knock on a friend’s front door and ask her to play? When did she start to become her own little person instead of the timid little barnacle she’d been for the first few years of her life? It’s not about enjoying every moment. Tantrums and bickering and arguing aren’t a whole lot of fun, and pretending they are doesn’t help anyone. But no day is a complete waste, and we can treasure the days and relish the charms of the present by noticing the good in between the hard moments, by stopping to notice the little people around us as growing, changing individuals, by soaking up the memories. So enjoy today, mama. Notice how the summer sun has given them tan lines around their flip flops and shirt sleeves. Compare their features to the ones you knew when they were babies. Listen for the giggles and moments of kindness. And treasure today for what it is…a once in a lifetime chance that you’ll never get back. I feel the exact same way. 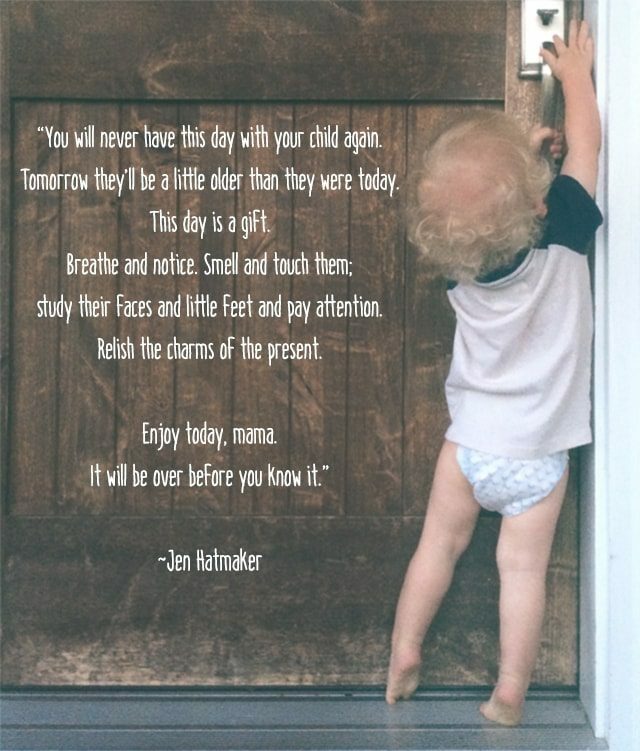 It is unrealistic to love every moment, but it is certainly worth the effort to find joy in each day with a precious child who will be grown up and gone before we know it. “I couldn’t help but feel like I was really seeing her for the first time in weeks.” Wow. So true too. Life gets so busy, even when you’re really not doing much of anything, and it can be several days before you feel like you are catching your breath and remembering to be in the moment. I shared something similar this week, about finding the balance of not wishing away the hard seasons and not taking the sweet ones for granted. It’s a beautiful and challenging balance.